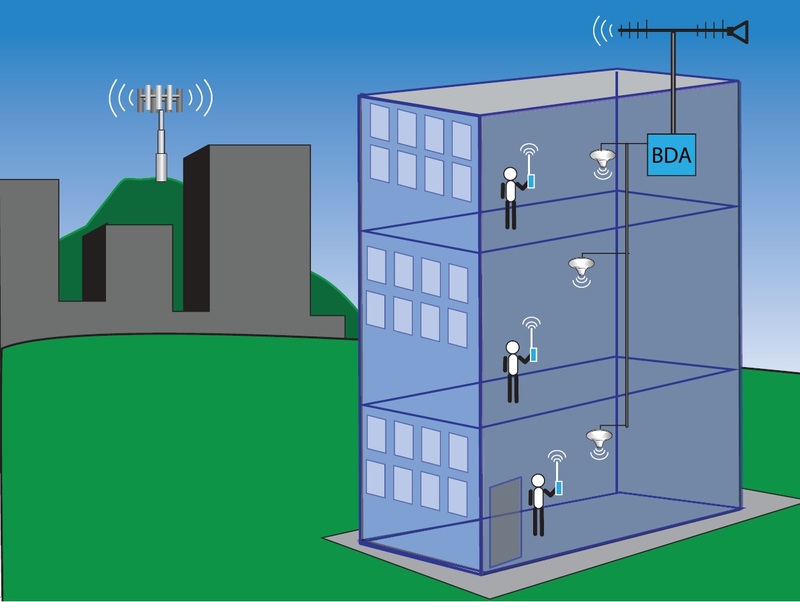 The simplest form of DAS can be built using over-the-air directional antennas . This is suitable for small buildings with a limited number of users. Such a setup tends to cover a particular frequency or carrier. Typical installation involves a directional antenna facing a specific carrier’s tower or signal source. The antenna is usually placed on the roof of the building or an area where it has an unobstructed line to the carrier’s signal. Low-loss coaxial cable is run between the antenna and a bi-directional amplifier (BDA) inside the building. These amplifiers are also known as cell boosters or repeaters. RF signals from the BDA get split using passive RF components such as splitters or couplers and fed into various indoor antennas via coaxial cables. Some companies have group wireless plans with one of the carriers. If their employees are getting poor cell reception and experiencing frequently dropped calls, they can deploy these single-band and single carrier over-the-air DAS systems inexpensively with little or no RF expertise. Obviously, such systems won’t be adequate in multi-carrier or multi-band environments with a large number of users.